Our roots of Buddha tour is a blessing for every tired soul willing to connect with the divinity. 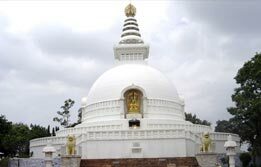 We specialise in Buddha tour and offer budget tour for Buddha roots. 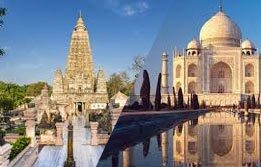 Our team of experts make customized Buddha India tour package to suit the needs of all kinds of travellers. From Patna to Bodhgaya and Varanasi to Kushinagar, we weave together some of the best Buddhist locations in our Buddha budget tour package. India has a fascinating history of Buddhism and our Buddha budget tour treats you with some of its remarkable chapters. Met on arrival and transfer to the hotel for overnight. After breakfast in the hotel transfer to the domestic airport for flight to Patna. On arrival, you will be met by our representative at the airport. Drive to Bodhgaya (140 kms / 4 hrs.) where Buddha attained enlightenment and which is one of the most sacred pilgrimage place for the Buddhist. Enroute visit Nalanda and Rajgir. Nalanda is a great centre of Buddhist learning and one of the most famed university citadels of ancient times. 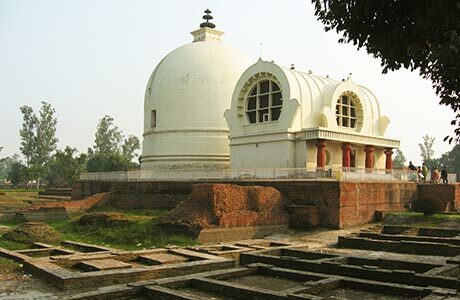 Rajgir is 10 kms south of Nalanda and sacred to the memory of the founder of both Buddhism and Jainism. On arrival in Bodhgaya check in the hotel for overnight stay. 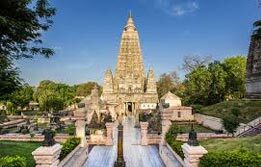 In the morning after taking breakfast go for the guided tour of the city visiting the Mahabodhi Temple where according to the history, the Lord was enlightened under the Bodhi tree. 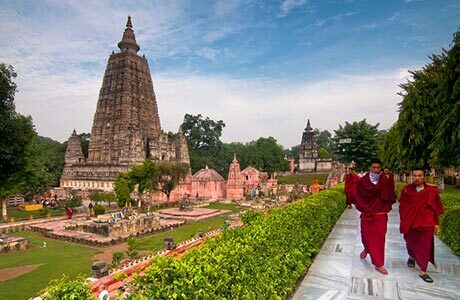 Mahabodhi Temple of Bodh Gaya is one of the holiest of holy pilgrim places for the Buddhists of the world. The Mahabodhi Temple built on the east of the sacred tree stands majestically 170 feet high on a base 50 feet square, and consists of a soaring pyramidal tower surmounted by a stupa. The Vajrasan or Diamond Throne lying between the Bodhi Tree and the temple marks the actual spot where Buddha sat in meditation and attained supreme knowledge. A gilded Buddha smiles upon the visitors from a niche in the wall of the temple. Unbelievable peace pervades the atmosphere giving credence to legend. Overnight at hotel. After taking breakfast leave for Varanasi by surface (235 kms / 6 hrs). On arrival transfer to hotel. Overnight at hotel in Varanasi. Go for an early morning boat ride in river Ganges to view sunrise and life at the ghats. After breakfast, go for excursion to Sarnath. 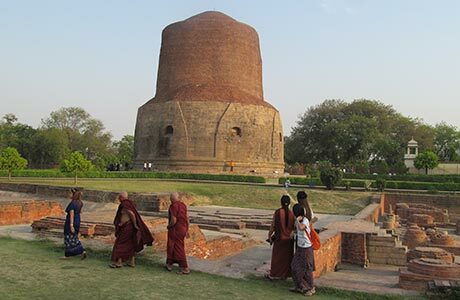 It was at Sarnath that Buddha gave his first sermon to his five disciples. Take a look at the magnificent 34-Meter high stupa and the mighty stone pillar erected by the legendary king Ashoka, who was faithful follower of the Buddhist religion. Afternoon visit other hotspots of the city - Bharat Mata Temple, Durga Temple, Tulsi Manas and the Banaras Hindu University. Overnight at hotel. Proceed for Kushinagar (275 kms / 7 hrs), enroute visit Vaishali. 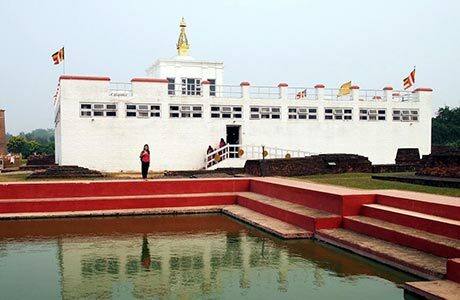 In Kushinagar visit the Mahaparnirva temple (where the Lord attained 'Mahaparnirvana'- release from the endless cycle of birth and rebirth) and visit the 'Rambhar Tila', where the mortal remains of Buddha are said to have been cremated. Overnight in Kushinagar. Proceed for Sravasti enroute visit Lumbini - is the place where enlighten Gautam Buddha was born. On arrival Sravasti transfer to hotel. Overnight in Sravasti. In the morning visit Sravasti (Sahet -Mahet), capital of the ancient kingdom of Kosala, an active centre for Buddhism. 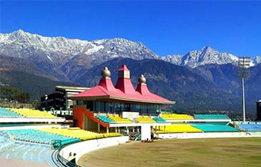 Situated 165 kms from Lucknow and 15 kms from Balrampur. Sravasti, the capital of the ancient Kingdom of Kosala, has the honour for sheltering Buddha for 24 rainy seasons in the Jetvana Vihar, this Vihar was offered by wealthy merchant Anath Pindika. The city believed to be founded by the mythological King Sravast, has age-old stupas, majestic monasteries and several temples. On arrival Lucknow transfer to hotel. Overnight in Lucknow. After a relaxed morning transfer to railway station to connect train for Delhi. Upon arrival transfer to hotel . overnight stay in Delhi. After breakfast go for the full day guided tour of Delhi. In the morning visit Old Delhi and Rajghat -the "samadhi" of Mahatma Gandhi, Jama Masjid and the busy bazaars of Chandni Chowk. In the afternoon visit the beautiful city of New Delhi, built by Edwin Lutyens and Herbert Baker, and the historic Qutub Minar. Later in the evening departure transfer to the international airport for flight to the onward destination. Evening transfer to Railway Station to connect board Train # 4201 Lucknow MTJ Express dep. 23:30 hrs. Overnight on board. Arrive Agra at 07:00 hrs. Visit the Taj Mahal, unquestionably the world's most magnificent monument of Love. 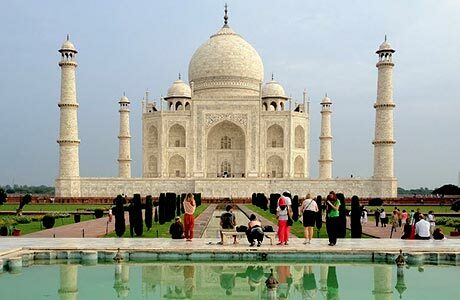 Taj Mahal, a colossal, perfectly proportioned mass of white marble, it is literally a jewel - fashioned over 22 years by hundreds of skilled craftsmen and over 20,000 labourers, to float like some fantastic mirage upon the Yamuna. The Taj is today considered as one of the wonders of the world. In the afternoon drive to Delhi and check into hotel. Room on Twin Sharing Basis at each place as per itinerary for total 09 nights. Hotel check in / out 12:00 hrs. English speaking guide at each places as per the itinerary. Early Morning boat ride at Varanasi.